Oliver Vaughan Snell Bulleid (1882-1970) was a British railway and mechanical Engineer and was the Chief Mechanical Engineer of the Southern Railway between 1937 and the 1948 nationalisation, developing many well-known locomotives, including No 34004 Yeovil. 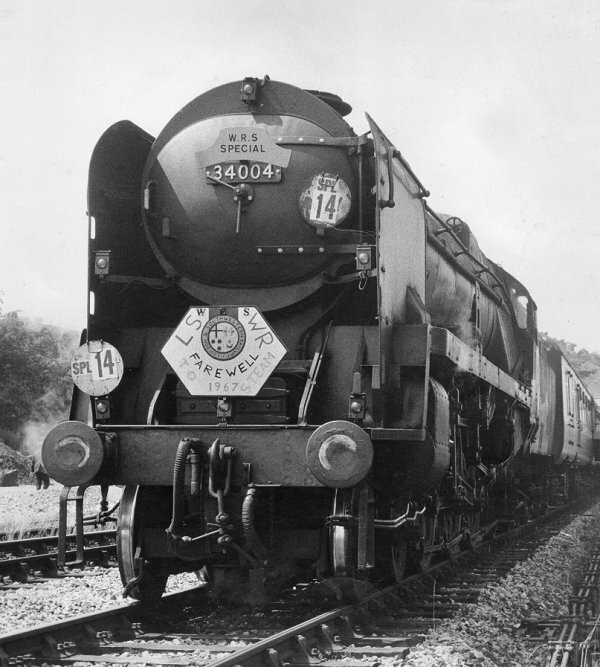 Bulleid designed the Light Pacifics to work over the restricted secondary routes of the Southern Railway, but with as much power as possible. The Southern Railway West Country and Battle of Britain classes, collectively known as Light Pacifics or informally as 'Spam Cans', were air-smoothed 4-6-2 Pacific steam locomotives. 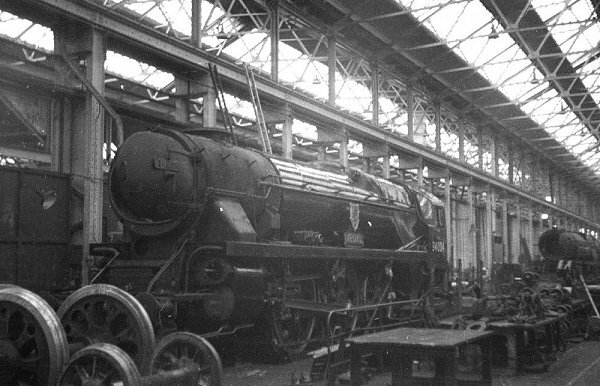 Incorporating a number of new developments in British steam locomotive technology, they were amongst the first British designs to use welding in the construction process, and to use steel fireboxes, which meant that components could be more easily constructed under wartime austerity and post-war economy. They were designed to be lighter in weight than their sister locomotives, the Merchant Navy class, to permit use on a wider variety of routes. They were a mixed-traffic design, being equally adept at hauling passenger and freight trains, and were used on all types of services, frequently far below their capabilities. 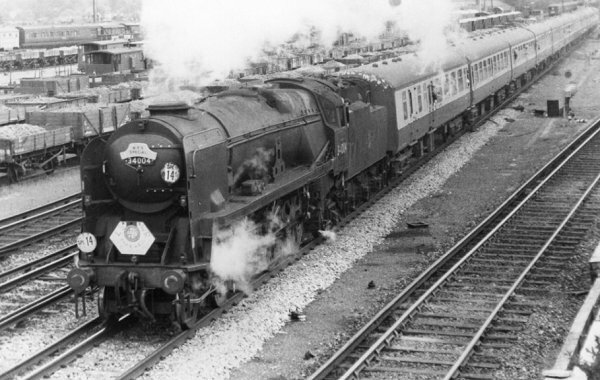 A total of 110 locomotives were constructed between 1945 and 1950, named after West country towns and Royal Air Force and other subjects associated with the Battle of Britain. 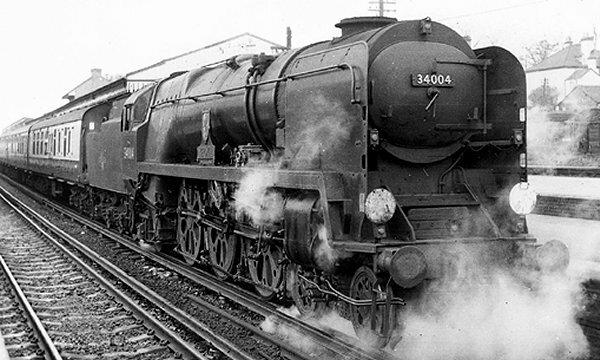 No 34004 Yeovil was built in Brighton in June 1945 and ceremonially named on 2 November 1945 at Yeovil Town Station (see photo below). In 1948 the newly formed British Railways held trials between the former railway company’s locomotives. No. 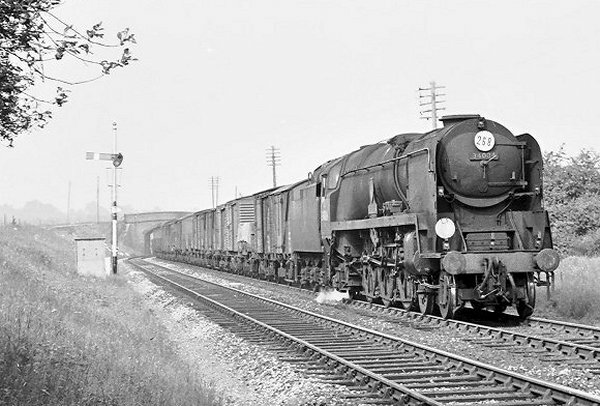 34004 Yeovil was chosen to work over the Highland main line between Perth and Inverness, with a LMS 4,000 gallon tender to provide water pick-up. 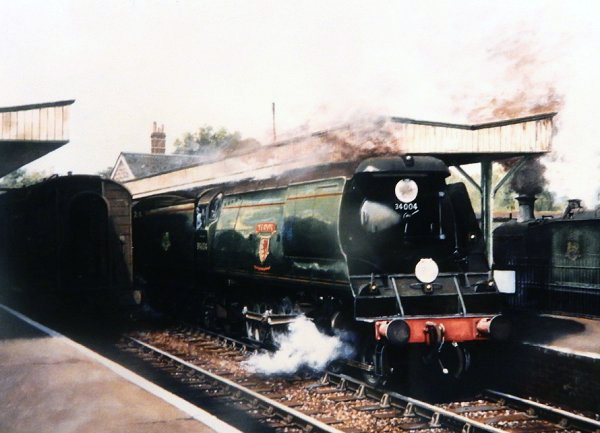 Due to problems with some of the new features, such as the Bullied chain-driven valve gear, sixty locomotives including No 34004 Yeovil were rebuilt by British Railways during the late 1950s. This produced a design highly similar to the rebuilt Merchant Navy class. 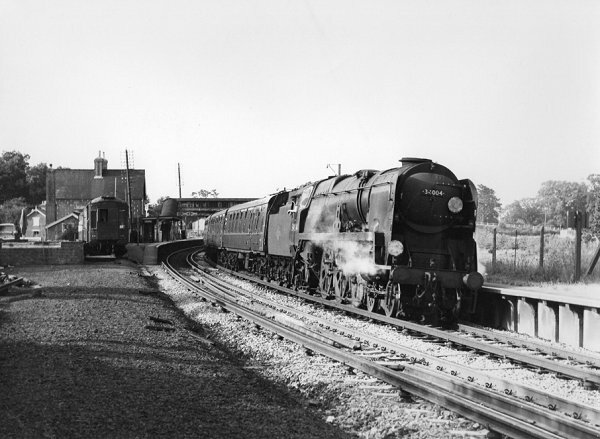 The classes operated until July 1967, when the last steam locomotives on the Southern Region were withdrawn. No 34004 Yeovil was rebuilt at Eastleigh in February 1958 and finally withdrawn in July 1967. 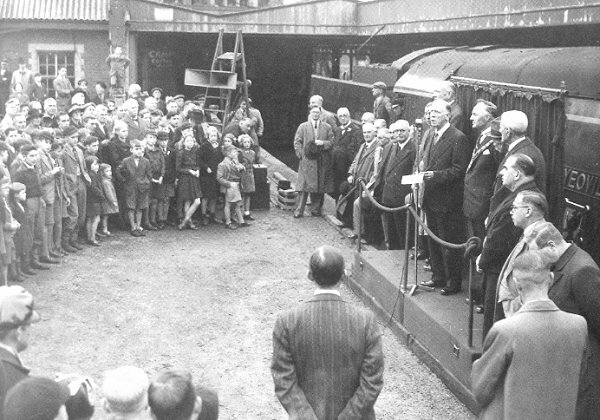 On 2 November 1945 No 34004 Yeovil was ceremonially named at Yeovil Town Station. The dignitaries included Clive Pearson, Director of Southern Railway Company, Mayor of Yeovil WS Vosper and Col HCC Batten, Town Clerk. Southern Railway West Country Class Locomotive No 34004 "YEOVIL" being named at Yeovil Town Station on November 2nd 1945. (From left to right) Mr Batten, Yeovil Town Clerk, Hon. 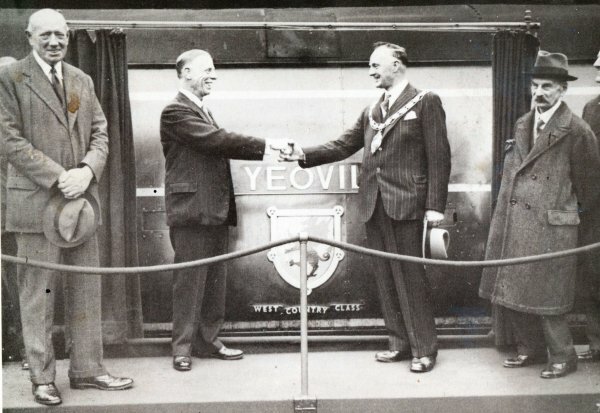 Clive Pearson, Director of the Southern Railway, Mayor of Yeovil, William Sidney Vosper and Councillor Herbert Higdon. 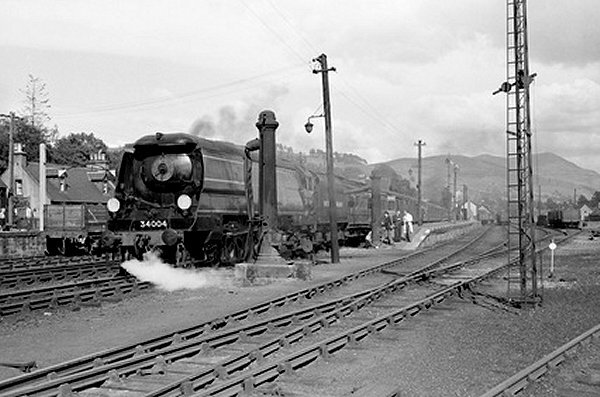 No 34004 Yeovil at Blair Atholl, Scotland, on 15 July 1948 - before the rebuild. 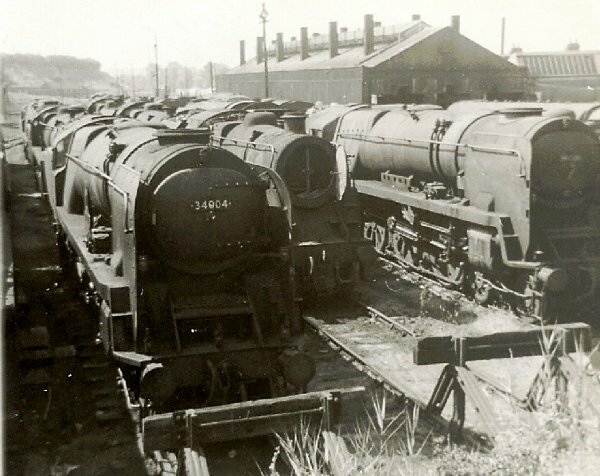 No 34004 Yeovil at Eastleigh Works, Hampshire, in 1963. No 34004 Yeovil at Yeovil Town Station. No 34004 Yeovil at Enborn Junction in 1964. 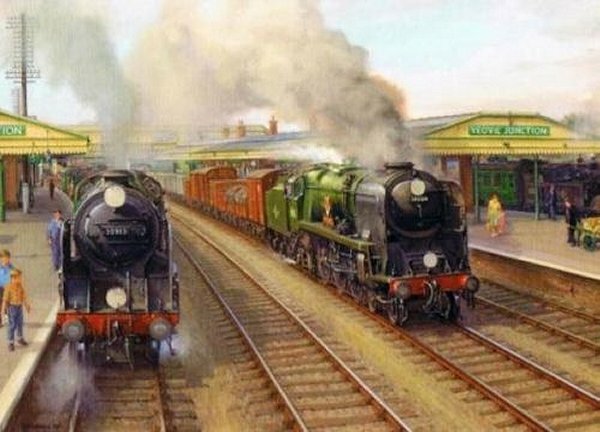 Painting by Robin Pinnock "Yeovil at Yeovil Junction". No 34004 Yeovil is seen passing through on a freight train to Woking. No 34004 Yeovil photographed at Weymouth MPD (Motive Power Depot - for the uninitiated like me) in 1967. Andrew Wardle, who sent me this photograph of 34004 Yeovil, recalls "It was taken in Weymouth MPD in the summer of 1967. At the time I was 13 and happily recall spending a great deal of the family's fortnight holiday in Weymouth actually on my own, wandering around the deserted depot. The West Country and Battle of Britain class locos were fabulous sights, sadly I never saw one in steam until the preservation of them began. I remember dragging my father along one sunny day to take the photo and I'm glad I did. I suspect it would be one of the last photos taken of it before it was cut up at Cashmore's in Newport. The engine, along with most of the others in storage there, looked as if you could fire them up at any time. I think the one to the right of Yeovil was 34095 Brentor; it, along with Yeovil and 34093 Saunton, just out of shot to the left, were all withdrawn in July 1967. Great memories. 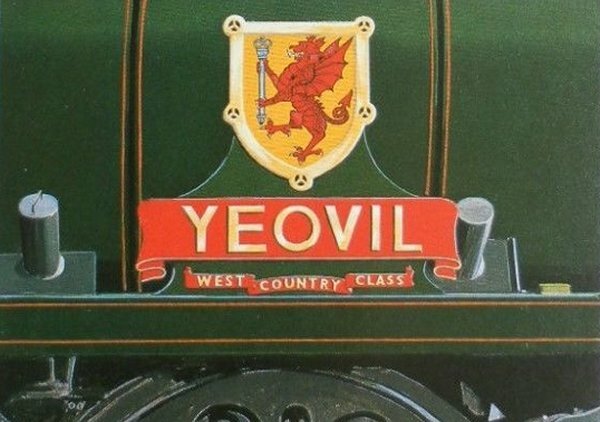 No 34004 Yeovil's shield and nameplate, taken from a postcard. No 34004 Yeovil at Lyndhurst Road station in the New Forest. The station was renamed Ashurst in June 1997. No 34004 Yeovil at Basingstoke in February 1967. 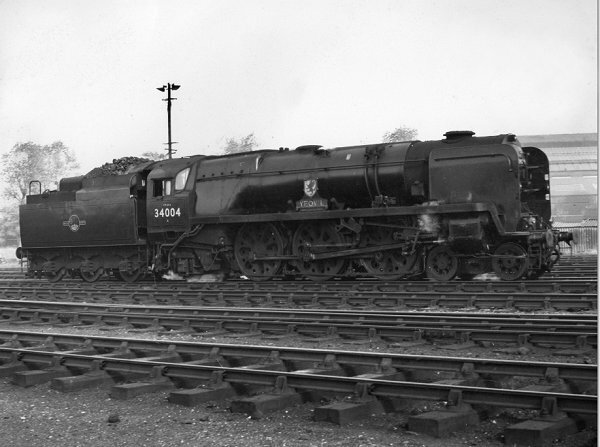 No 34004 Yeovil in rebuilt form, photographed at Woking on 11 June 1967 on the "Farewell to Steam" run. No 34004 Yeovil in rebuilt form, photographed at Corfe Castle on 11 June 1967 on the "Farewell to Steam" run.